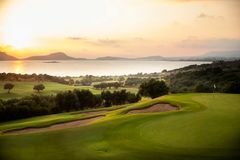 As Greece’s popularity as a golfing destination has risen sharply over the last few years, Costa Navarino has been at the forefront. Winner of the IAGTO Golf Resort of the Year 2017, their two coastal courses, The Bay and The Dunes, are now considered to be the top two layouts in Greece, with Bernhard Langer’s design for The Dunes leading the charge. The opulent resort at Costa Navarino is surrounded by miles of unspoiled greek countryside and the pure blue of the Ionian Sea. Undoubtedly one of the best resorts in Greece, Costa Navarino offers the best in 5-star luxury, with extensive facilities on-site, such as a state of the art spa, four distinct restaurants and selection of pools. The resort's 18-hole championship golf course designed by US Masters Champion and Ryder Cup Captain Bernhard Langer in association with European Golf Design and professionally managed by Troon Golf, offers spectacular sea and river views and is the first signature golf course in Greece. Just a stones throw away from Navarino Dunes at the Navarino Bay development lies the Bay course which offers a different, but equally enjoyable, test to the Dunes course. This 6,299 yard par 71 places an emphasis on straight hitting and course management and it is no surprise that it is an extremely enjoyable golf course as it was designed by the revered architect Robert Trent Jones Jr. Multiple tee positions makes the course accessible for golfers of all abilities who will no doubt be inspired by the sweeping views of the coast and the nearby mountains. The peaceful Costa Navarino Resort near Pylos, rests on a breathtaking stretch of sandy beach along the coast of the Ionian Sea. Inspired by old Messinian mansions, the resort's low-rise villa clusters have been constructed tastefully with natural stone and local design elements to stunning effect. There are 445 deluxe rooms and suites and 123 of them come with private infinity pools, while the others afford access to an extensive common pool area. Four distinct restaurants and various pool, lounge, and chill-out bars, each with different views of the landscape, provide a tempting range of international and local cuisine. Other features include the large spa and thalassotherapy centre located within the resort complex provides a haven of renewal. The specialty treatments based on Asian and ancient Greek philosophy use the area's unique natural products and elements. Rooms are everything you expect from a five-star resort. Living areas are sumptuously furnished and spacious, and they are also very well equipped. Most come with dual-line phones, voice mail, in-room movies, and refreshment centre. Other attractive features include floor-to-ceiling windows, flat screen television 24-Hour room service and wireless high speed Internet access. The resort is well placed to provide easy access to the best this intoxicating region has to offer. UNESCO World Heritage List sites, including famous Olympia, Mystras and the Temple of Apollo Epicurius, as well as Ancient Messini, the Palace of Nestor, are all within driving distance. Guests can also enjoy one of the 321 luxury rooms at The Ramanos Resort, all with views of the sea or the beautiful gardens at the resort. Rooms vary from deluxe rooms, to infinity rooms with individual infinity pools, to grand suites including state-of-the-art home cinema systems. All rooms are furnished in a modern, elegant style and feature all the amenities one would expect from a top class resort such as this. Guests also have the option of villas, ranging from one bedroom to three. All include a spacious lounge and dining area as well as a private terrace with infinity pool and unparalleled views of the sea. We were upgraded to a suite with an infinity pool and sea view - so could hardly have been better. Breakfast remains splendid. Location and facilities top notch. Only downside is price of food and drink on site which can be twice as high as local area. I would say buggies are helpful as on some holes the walk from Green to Tee was considerable, but perfectly do able as the course is not hilly. A lovely course and the organisation from the golf staff amazing. Lovely quite tricky course, wonderful views! There is extensive construction work going on which has led to changes to the course lay out. It continues to offer spectacular views but ( see comments above) there was not enough time to enjoy it as much as on previous visits. Compared to previous visits the course was very busy - perhaps too busy which led to chivying to hurry up which detracts from the experience. It ali left virtually no choice of tee times or playing partners. Fortunately the 4 balls I was put in proved friendly but it could easily have gone badly wrong. I assume there had been a special promotion that may have been too successful. Perhaps I have been spoiled by enjoying the courses in the past when time was not an issue.